It is officially autumn now. I like that word, autumn, though I usually use the word fall instead. Fall is an everyday kind of word. Autumn seems a bit stiff and formal, but I will use it today. Last Saturday was the first day of autumn. I think this could be a really amazing season this year. September has been fantastic, with almost no rain. I read that October is going to be drier than usual, too. I’ll take the dry weather as long as possible. A little rain would help water in the cover crop, but I’ll use a sprinkler if I have to. It is time to get the cover crop in. Several beds are cleared out now; I harvested the Galeux D’Eysines and Sweet Meat hubbard squash, along with the Rogue vif d’Etampes and miniature pumpkins. They didn’t do great this year, but there are a few. A couple of the potatoe beds were replanted, but a few others are now clear. There are some more beds that are ready to clear, too. It seems like the summer pests should be going away now, and, unfortunately, the slugs coming back. But, not all the summer pests are gone yet. 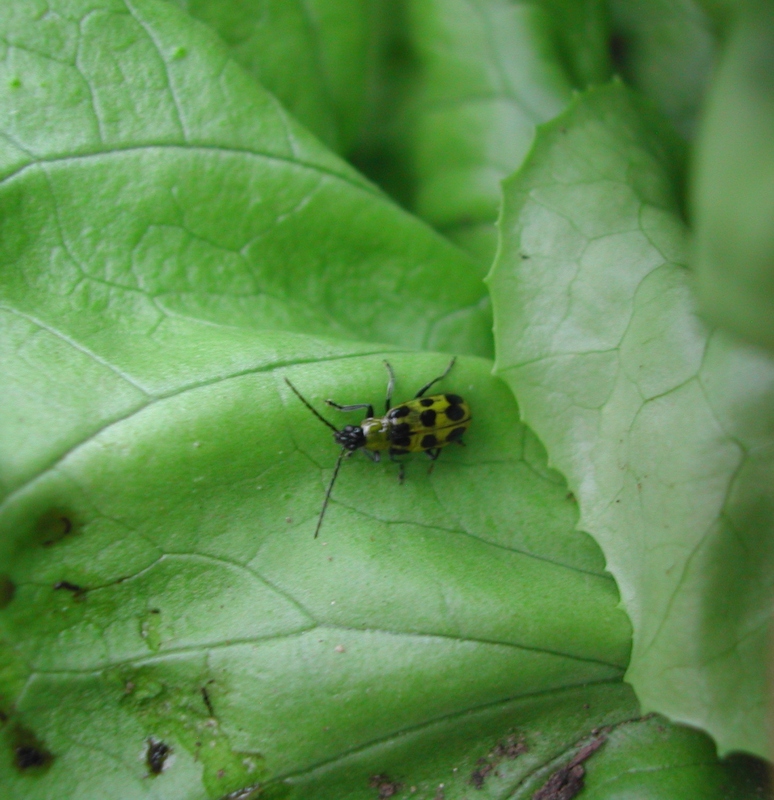 There is one that I have noticed more this year in the lettuce and Swiss chard: The Western Spotted Cucumber Beetle. Yes, a cucumber beetle in my leafy greens. Most people only talk about it in reference to cucumber and squash plants. They say their plants have been covered in beetles. 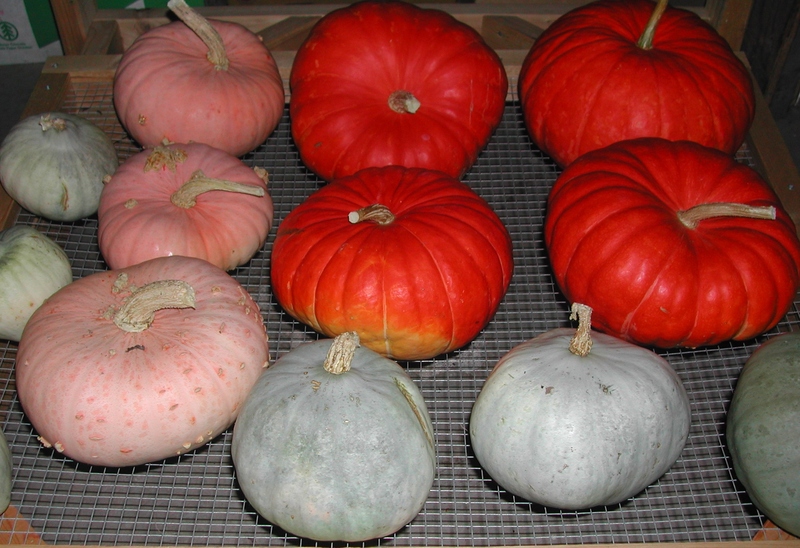 I have only seen one or two of them at a time and more in the leafy greens than squash. The Pacific Northwest Insect Management book says the adults eat the leaves of plants, but it is usually not a problem late in the season. They are doing a bit more damage than I want to see to some of my Swiss chard and lettuce. They are kind of funny bugs. Since there isn’t a huge infestation, when I see one, I just squish it. But, they have this trick, if you don’t catch them first try, they drop off the leaf, and usually, out of sight. Now that I know the trick, I am a bit better at getting them on the first try. I’ll keep after the ones I find, but hopefully they will go away for the winter soon.